You can hear the father’s hope and his anguish in the words he sent to the South Carolina Legislature. Not on his own behalf was he asking, in words that must have been written for him since he himself could not even sign his name. No, he was asking for his family. His wife, his son, his daughter. Their names were Sarah, George and Mary. And the frieze-frame image of a moment in their lives that’s captured in records The Legal Genealogist came across in the South Carolina State Archives yesterday can break your heart. And you already know what the Legislature did, on 11 December 1838, right? A life of hard work, industry, honesty and care… and it didn’t matter one bit. I wasn’t able to find out, yesterday, just what happened to James and his family. I couldn’t even begin to imagine how they must have felt when they heard back from the Legislature. I can’t help but wonder how they coped… how they went on with their lives, knowing that their family was horribly at risk when James died. This is one of those stories where you’re almost afraid to find out how it ends. And one of those stories that, whenever we find them, we must tell. Terrific find! Thanks for sharing this story and research! It is very necessary to expose these past historical finds to better understand the depths of historical slavery in personal narratives. Cheers! What courage it must have taken for James to collect the signatures, and then approach the Legislature to ask them to approve the manumission of his family. He must have known the chances were slim, but his effort speaks to his love for his family, whom he had already purchased. The story is, as you say, incomplete, as we don’t know what happened after the Legislature so cruelly turned him down. Would make a good dissertation project for someone to try to track him and his family. I’m currently reading the 2007 book “Dreams of Africa in Alabama: The Slave Ship Clotilda and the Story of the Last Africans Brought to America,” by Sylviane A. Diouf. While the transatlantic slave trade was outlawed by the US in 1807, multiple ships continued to illegally make the crossing. The Clotilda was the last, the result of a bet that he could do it and not get caught, by a small-time Mobile plantation owner, just before the outbreak of the Civil War. He won the bet. The author did a lot of research, both in Africa and America. Many of the survivors ended up living very near where the ship was scuttled on the Mobile River. After Emancipation, they founded an all-black town, which still exists on the outskirts of Mobile. The last survivor of the voyage lived until 1935 and was interviewed by Zora Neale Hurston, who wrote a book called “Baracoon.” This wasn’t published in her lifetime, though recently it has been. A fascinating look at slavery from the view of individuals who could remember their origins in Africa and pass at least some of it in oral history to their descendants. Within the last couple of years, a drought exposed what researchers believe to be the wreck of the Clotilda; archaeologists are working on getting it out of the silt so they can preserve it and prove/disprove its identity. What a sad story. The Committee’s cruelty (there’s no other way to view their decision) stands a testament to the power of an economic system that warped, and for far too long, threatened to destroy, the basic moral fabric of our nation, embodied in principles laid out in the Declaration of Independence. Like so many others, I hope this column inspires further investigation that will uncover the rest of the Paterson family’s story. Hi Judy, perhaps someone has already shared: mulattos Sally Paterson, aged 58, George Paterson, aged 38, and Mary Paterson, aged 19, were enumerated in the 1850 Richland Co. SC census. James was not enumerated with them. In 1840 enumeration, James was enumerated with both slaves and FPOC. 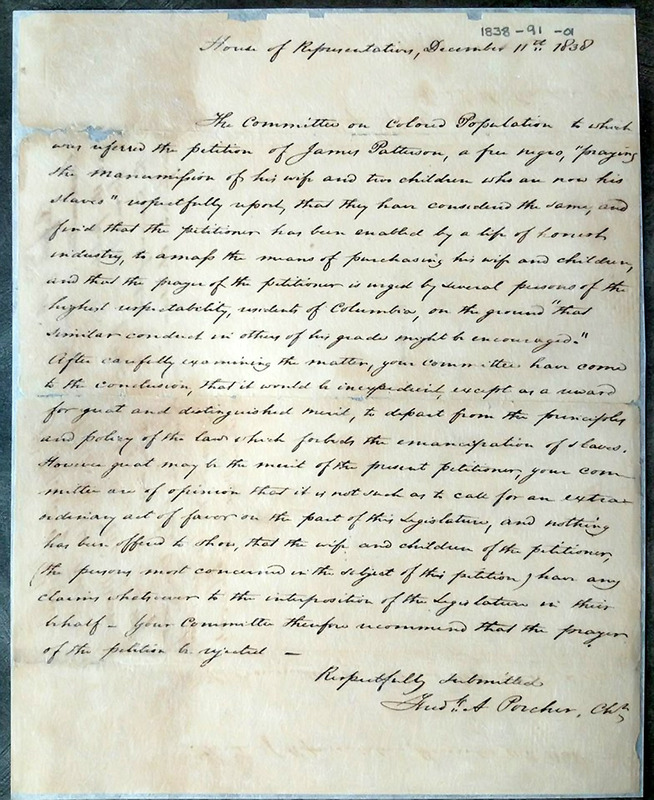 Interestingly, there’s an 1821 petition to SC judiciary committee from James Paterson, “a mulatto,” asking to inherit his father ‘s [inferred George] estate. I’ve ordered it. (Catnip!). I will order the petition too. See who signed it. Could be interesting. fyi: Really appreciated your talk on DNA ethics in Columbia. Thank you. Ooooh… neat info, Lahnice, thank you!